It shocks me to see salespeople cold calling with no research done on their prospects. Perhaps you don’t know them specifically, but if you want to increase your win rates, you better be sure that you do some fact finding before you call. Learn about your customers business, the industry they’re in, and (if you can) the individual you will be speaking to. Prepare some insights about their business and industry, and use the YOU/BECAUSE method as much as possible with the research you have done to get buy-in. 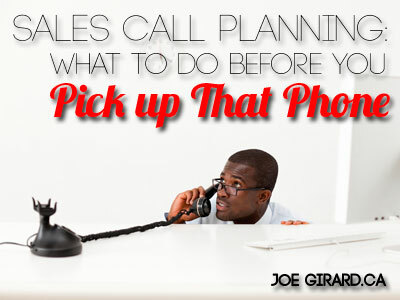 And for your follow up calls, make sure you are prepared as well. 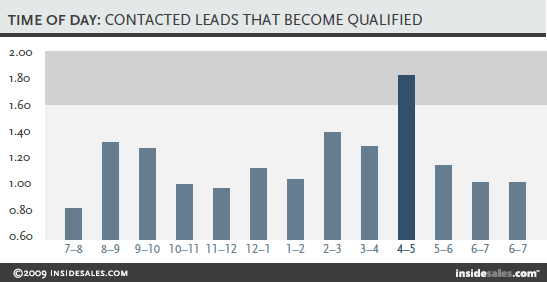 Thursday is the best day to contact a lead in order to qualify that lead. It is 19.1% better than Friday, which is the worst day. 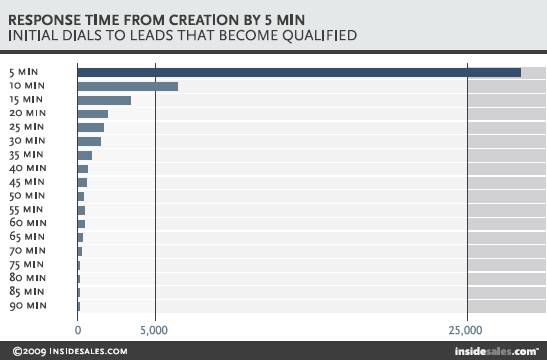 4-5 pm is the best time to contact a lead to qualify that lead. 4-5pm is 109% better than 11-12am. The odds of qualifying a lead in 5 minutes versus 30 minutes drop 21 times. And from 5 minutes to 10 minutes the dial to qualify odds decrease 4 times. So the first thing you must do is to ensure you are set up to respond to new inquiries immediately. If you don’t, someone else will. And for your sales calls, start tracking your own times of day for getting ahold of people. For your business, do some research on your competitors and see how fast they respond to inquiries and what types of tools they use to convert. Gather your own data to strengthen your sales process. There are quite a few studies like this one and you may even find ones that are specific to your own industry. If you can’t find one, contact a CRM or marketing automation vendor and see if they have some data they can send you. As I have mentioned in previous posts, your intentions make a huge difference in sales. You have to switch your mind into a ready state and present yourself with the right energy so your client can feel your presence. Turn off any distractions, remove from your mind any of the stresses of the day, and block out anything that would take your attention away from the person you are talking to. Don’t just pick up the phone and wing it! The best way to do this is to practice the idea of being 100% curious about the other person you are talking to. Put in your mind that you can’t WAIT to talk to them and learn about their life, their challenges, and see if you can get them excited. That kind of intention setting takes a bit of practice, but it will make your calls so much more enjoyable for both parties. Try it! As part of my sales psychology series, I will be digging into some effective rapport building skills that will help you connect and engage with your clients. A big one is to demonstrate a dramatic difference in your client’s mind. What do you do to stand out to them? Can you get them to say, “Wow!” when you speak with them? Does your reputation precede you? Are you already known as an expert in your field, someone with credibility, and the BEST person to solve their problems? If you enter the sales call with them already excited to meet you and talk business, you are miles ahead of your competition. Questions are the key to everything if you really want to make the most of your calls. Get really good at asking them, then listening, then asking deeper questions to gain understanding. If you have a few moments, make sure you read my post on SPIN Selling as it gives you a killer formula for preparing great questions. So before your next call, outline a few key pieces of information you would like to gather, and create a few different questions to help you get the info. This practice will also help you focus on the customer and not yourself. When I ask salespeople what their commitment objective for their calls are, most often they reply, “To get the sale.” Okay great, but what else? the second answer is usually, “To get an appointment.” In today’s complex sales environment, we don’t make the sale on the first call, nor do we get the appointment as often as we like. But time and time again, salespeople go into their calls with only those two objectives in mind, then are disappointed when they don’t get success. Look at your stats on win rates for your calls. How often do you get the appointment? What else can you have someone do BESIDES an appointment? A commitment objective is something you can get your client to agree to do that will help move the sale forward. This is why I hate the “check-in” phone calls. There is no objective. What will I get them to agree to do next? Secondary: Get your client to agree to review some information you send them. An article, a video, a PDF, an online training, a demo, etc. They could also agree to visit your facility, attend an event you are hosting, or meet you somewhere for an activity. Have fun with these as you can create amazing opportunities with your commitment objectives! Tertiary: Get them to agree to a follow up call. This is a step that most salespeople miss. They leave their calls hanging with no confirmed next step. When you confirm a good day and time to follow up, you are able to test their level of commitment, answer any further questions, and get them to buy into the process. If they don’t agree at this stage for a follow up call, you have a window of opportunity to address an objection you haven’t covered yet. If they agree to a follow up call, you are one step closer. Follow those tips and you will be miles ahead of your competition. Preparation is important, but so is getting your head in the right place. You must find a way to challenge yourself and make your calls fun. It will take some work to prepare your materials, and practice, but if you want to be a top performer, you have to do what others wont. If you want to be a top performer, you have to do what others wont. Get out and make some calls! And remember to subscribe below for more content like this! Hi Joe, Thanks for this very helpful article. Just want to mention that the Personal Branding pdf doesn’t work accurately (in terms of text/Font)? I’m working on a Mac by the way. Thanks for letting me know! Now we are chatting via email, so maybe we found the hidden opportunity?